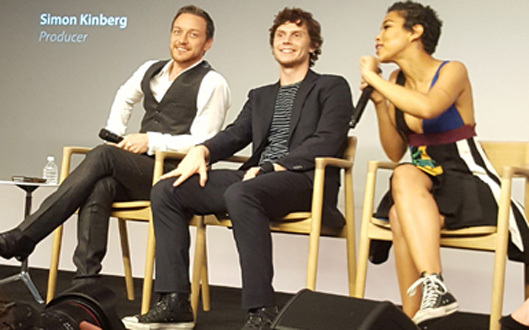 *Cast members Alexandra Shipp (Storm), James McAvoy (Professor Charles Xavier), Evan Peters (Quick Silver), Tye Sheridan (Cyclops), and Lana Condor (Jubilee) of “X-Men: Apocalypse” stopped by the Apple Store in New York recently to be interviewed and greet fans. Much attention has been swirling around new members, especially Alexandra Shipp, who plays Storm. She not only plays a big part in the “X-Men” series, but a part in the comics’ Black Panther storyline. 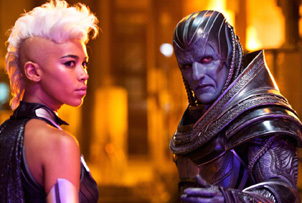 Storm (Alexandra Shipp) and Apocalypse (Oscar Isaac). McAvoy was also happy to take Professor X in another direction. “It’s a new challenge because he’s felt very much like three different people. I’ve been fortunate enough to portray parts of Charles I don’t think we’ve seen a lot of in the books or in the cartoon, or in the previous movies. As the Q&A session came to an end, the question poised was how would they like to see their characters in the future? “I would love to get involved with the kind of mind battle that you can only get involved in with another psychic character like Psylocke or Emma Frost, or any of those guys,” McAvoy offered. “That would be awesome.” Shipp wants Storm to be more empowered. “I want Storm to become the matriarch that she needs to be,” she concluded.